THREE VOICES OF THE SHADOW: ORSON WELLES, BILL JOHNSTONE & BRETT MORRISON. Okay, the headline's a pun - referring as it does to The Shadow's ratings. But it's really hard to take a hero seriously who could make himself invisible. Although this site deals primarily with the history of Network Radio in general and its programs heard during the prime time hours - 6:00 to 11:00 p.m. Eastern Time - attention has to be given to The Shadow, the most popular of all Sunday afternoon programs and the Mutual Network’s premier entertainment attraction. We first encounter Welles as Cranston/The Shadow in the broadcast of October 24, 1937, posted below, The Temple Bells of Neban. If listeners thought Lamont Cranston’s ability to cloud men’s minds was far-fetched, in early episodes of the program he could read men’s minds as well. Liberal use of this additional talent is found in the episode from January 16, 1938, Sabotage. Welles remained in the title role through the summer run of The Shadow, a transcribed syndicated series sponsored by B.F.Goodrich. An episode from this series dated July 24, 1938, The Mark of The Bat, is posted below. Critics dismissed The Shadow as simplistic, formulaic and juvenile. Perhaps so, but its longtime sponsor in cold weather states didn’t market to juveniles. And the program was doing just fine for the Delaware, Lackawanna & Western Coal Company whose product became known to millions as Blue Coal, the most famous name in home heating fuel. Dying anthracite coal blue during its washing process was originated a decade earlier by the Glen Alden Coal Company in upstate New York for its Blue Diamond brand coal. The bluing was simple and cheap - branding every piece of the commodity with no labels required. Delaware, Lackawanna & Western sponsored The Shadow for over a dozen years and sold Blue Coal by the tons - millions of tons. 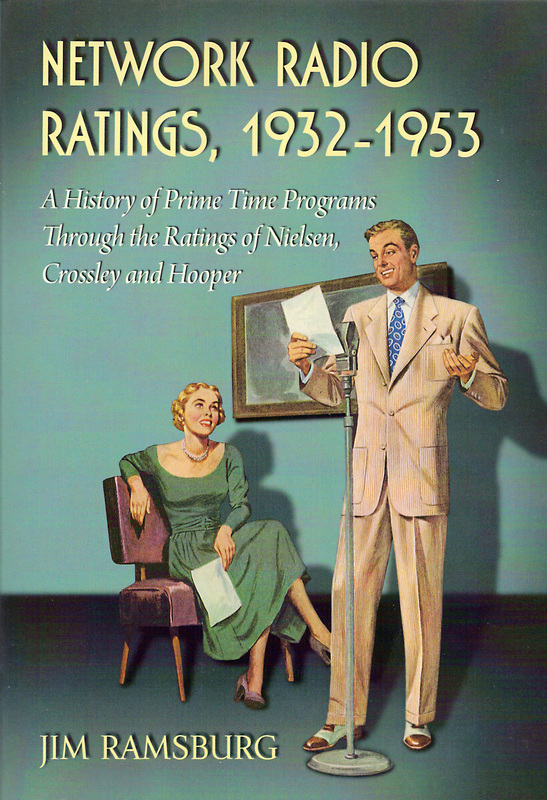 Among the half-dozen stories about the show’s beginnings on NBC and CBS followed by its long run on Mutual in Network Radio Ratings, 1932-1953, a chart on page 66 illustrates how The Shadow’s Sunday afternoon ratings would have ranked among the prime-time programs from 1941-42 through 1952-53. The program created by Walter B. Gibson peaked in 1942-43 with a 15.5 rating which, if it were in prime time, would have tied for 22nd place with The Kate Smith Hour in the Annual Top 50, heard in an estimated 4,743,000 homes by almost twelve million listeners. An episode from that season, November 8, 1942, The Wailing Corpse starring Bill Johnstone and Marjorie Anderson, is posted below. When measured against other programs in the detective/mystery category, the 1942-43 season was again the best recorded by The Shadow. It was second only to Mr. District Attorney, which was in the first of its three Top Ten seasons. The Shadow drew more listeners than two Top 50 entries, The Adventures of The Thin Man and Mr. & Mrs. North, plus the less popular programs that season, Lights Out, Inner Sanctum, Crime Doctor and Gangbusters. The Shadow’s ratings dropped 15% to 13.2 in 1943-44 which would have placed it 32nd in the Annual Top 50 and was fourth in the genre behind Mr. District Attorney, The Adventures of The Thin Man and Mr. & Mrs. North. More importantly, it was Brett Morrison's first full season in the title role. Morrison is heard with Marjorie Anderson in the episode posted below from March 19,1944, The Drums of Doom. John Archer became The Shadow during the 1944-45 season and the ratings roof fell in. Lamont and Margo fell into single digits and were passed in ratings by the aforementioned three plus Big Town, Crime Doctor, Molle Mystery Theater, Suspense, The Saint, The FBI In Peace & War, Hollywood Mystery Time, Death Valley Sheriff, Gangbusters, The Adventures of Sherlock Holmes, Inner Sanctum and The Adventures of Ellery Queen. The Shadow fell to 16th in its category and never quite recovered. Morrison returned to the title role in 1945 and Grace Matthews became Margo Lane in 1946. They appear together in the episode posted below from February 2, 1947, The Scent of Death. They appear together again in the episode from January 2, 1949, Death And The Crown of Odalph. The two actors most remembered with the roles of Lamont Cranston and Margo Lane ​were Morrison and his constant companion from 1949-54, Gertrude Warner who often contended that she was hired for her ability to scream. The Shadow was classic radio pulp fiction. Its plots were highly predictable which probably led to its eventual loss of popularity. Week after week Lamont Cranston and the lovely Margo Lane tracked down another sadistic killer only to be separated. Without Lamont by her side, Margo would fall into the clutches of the villain. Then Cranston, who could “Cloud men‘s minds so they couldn‘t see him,” would return as the invisible Shadow to save the day. MARGO: Mr Darrow! Look! This panel! It moves! DARROW; Why so it does! DARROW; (INTERRUPTING & SNARLING) Shut up! MARGO: (MUFFLED) Let me go! Let me go! (FULL VOICE) Lamont! Help!! LAMONT: (AT DISTANCE OFF MIKE) Margo! MARGO: Where are we? Where have you taken me? MARGO: Let me out of here! Lamont!! MARGO: What do you mean? press...the spike-studded pit? Excellent for entertaining, don't you think? MARGO: Then - it was YOU! . MARGO: But why did you bring me here? MARGO: Why...why are you doing this? MARGO: Keep it away from me! SHADOW: (FILTERED MIKE) Drop that iron, Mr. Darrow! DARROW: (SURPRISED) Who was that? SHADOW: (FILTERED) Release the girl! DARROW: No! Let go of my arm! Let me finish my work! SHADOW: (FILTERED) There! Your work is finished, Mr. Darrow. and murder! But why did you do it? Why did you kill all those men? SHADOW: (FILTERED) What makes you think that? DARROW: Because, Mr. Shadow, none of us are leaving this building alive! MARGO: Look out! He's tipping over the fire in the forge! SHADOW: (FILTERED) Don't do that, Darrow! ...this old hall is a tinderbox...it'll burn in no time! MARGO: The fire is catching all over the room! DARROW: What are you going to do now, Mr. Shadow? LAMONT: Hold on to my hand, Margo. MARGO: This smoke, Lamont -- I -- I can't see! to... the...door... the...door... wait...wait...this is it! I’ve found the door!.. LAMONT: How do you feel, Margo? MARGO: Yes...we got out just in time...Any sign of Darrow? SHERIFF: (OFF MIKE, CALLING OUT) Look! Up in the belfry of the meeting house! There's someone standing up there! MARGO: Lamont...it's Darrow! He’s going to jump! LAMONT: Margo! Turn your head! And so another evil-doer bites the dust - in this case, literally. A preposterous script? Perhaps, but it was made almost believable and certainly gripping by the studio cast and production crew who worked on the show every week. In this example, Bill Johnstone was Lamont Cranston and Marjorie Anderson played Margo Lane. The vital organ scoring was provided over the program‘s run by Elsie Thompson, Rosa Rio and Charles Paul. Hear these masters of Mutual's mysterious melodrama at work in the complete performance of The Ghost Walks Again ​from March 16, 1941. Understandably, the invisible Shadow never made it to the visual medium of television. And that’s the way it should be for a program that depended upon listeners’ imaginations to exist and still lives in their fondest memories of Network Radio. (1) Short runs in The Shadow's title role were played by John Archer, (1944-45) and Steve Courtleigh, (1945). Agnes Moorhead was followed in the role of lovely Margo Lane by Margot Stevenson, (1938), Marjorie Anderson, (1939-44), Judith Allen, (1944-45), Laura Mae Carpenter, (1945), Lesley Woods, (1945-46), Grace Matthews, (1946-49) and Gertrude Warner, (1949-54).